The worst part about becoming an adult is having to pay your bills. Not only do you need to pay them, but they need to be paid on time and in full or you could face penalties in the form of fees or hits to your credit score. It’s a pain, but you pay them on time and move on. There are several ways to monitor how you pay your bills and make sure that you do pay them. The easiest way I’ve found is to set up a bill paying schedule. A bill paying schedule is where you schedule out your bills to not only remind you to pay them, but also to help you manage what you owe and to help you plan for paying off debt if you have any. Here are three reasons why it’s a good idea to set up a bill paying schedule. As mentioned, one of the biggest benefits of a bill paying schedule is to help you get your bills paid on time. This is probably the number one reason setting a bill paying schedule is important. It’s okay to pay bills as they come in, but if you let them sit, they can get lost in your mail pile or end up in the junk drawer. By setting a schedule of when bills come and when you pay them every month, you can avoid this scenario. Plus you may also be able to designate a certain area where bills go until they are paid on your assigned bill pay schedule. This will help you to know where they are so nothing gets lost. Another way to accomplish this same idea is using a tool like Personal Capital. Personal Capital is free to use and allows you to monitor all your accounts in one place so you can easily keep track of expense. By planning a schedule of when your bills are paid and which paycheck the money is coming out of, you’ll be able to manage your budget and money better. You might even be able to start saving money, even if your budget is limited. Instead of spending too much on other things, only to find out you don’t have enough funds to pay bills, you’ll know what needs to come out of your account and when. This way you can make sure you have the funds you need to pay the bills. This system takes effort and constant diligence, especially at first, but it pays off in the long run. Online bill pay is a great way to manage your bills. Unfortunately, it’s also a great way to forget when and what comes out of your checking account. With a bill schedule, you’ll know what is coming out and can plan your expenses around that schedule. This way there is no last minute panic of “there’s not enough here to cover my dinner.” You’ll be smarter, and know when it’s time to pop open that can of beanie weenies instead of having a steak dinner. Setting up a bill paying schedule is not hard and it doesn’t take that much time. 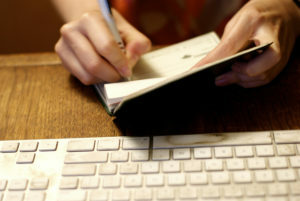 Take an evening a week or every two weeks to sit down and write those checks or pay online. Knowing where your money is going is the key to saving, getting out of debt, and watching for fraudulent charges. Once you get in the groove of actively managing your money and bills, it’s not hard to keep it up and smartly manage your finances. Do you have a bill paying schedule? Have you ever lost track of a bill and ended up with extra fees?